Digital video security and surveillance systems are such a cinch to install that they are now available easy do-it-yourself CCTV kits. Security Camera King's CCTV kits contain just about everything you'll need to install your own digital video security system except the tools. In addition, we're available to help you design your system to ensure you receive the maximum efficiency and protection possible. In addition, we also offer full support through every step of the installation process and can offer our unique virtual on-site technical assistance. Digital video security and surveillance systems are such a cinch to install that they are now available easy do-it-yourself CCTV kits. Security Camera King’s CCTV kits contain just about everything you’ll need to install your own digital video security system except the tools. In addition, we’re available to help you design your system to ensure you receive the maximum efficiency and protection possible. In addition, we also offer full support through every step of the installation process and can offer our unique virtual on-site technical assistance. If that’s not enough to get you interested in Security Camera King’s high quality CCTV kits, we can also remotely configure your Digital Video Recorder or DVR and system through your personal computer and an Internet connection. Further, we offer free shipping on all orders over $500.00. Just take a look at our security camera systems CCTV kits. We feature three different levels of HD DVRs including the economically priced Elite mini, the Elite Series, and the high-resolution enterprise level Ultimate Series. Each system is available in four, eight, or sixteen channels (cameras) which include 420TVL digital video cameras except the Ultimate Series that includes high-resolution 520 TVL cameras. In addition, we now feature a thirty two channel Elite Series DVR package. Our CCTV kits offer top-of-line DVRs that come with tremendous amount of valuable features that are standard and cost nothing extra. Our DVRs all use the H.264, the latest CODEC or COmpression/DECompression utility available to prepare your digital video files for storage and viewing. Plus, each on of our DVRs is IP or Internet Protocol ready. They can be plugged into an internet connection and offer a variety of Web related features such as remote viewing and camera control and e-mail alert notification. You can access your system anywhere in the world there is broadband Internet access and that includes using 3G and 4G smartphones. Security Camera King offers six different configurations for each of our four, eight, and sixteen channel systems. For example our 4 Channel systems we offer two Elite mini, two Elite Series, and two Ultimate Series CCTV kits. Each kit comes with the DVR, your choice of digital video cameras, wiring, connectors, and power supplies. In addition we allow you to custom design components so that the system is tailor made for your specific applications (some modifications may require an additional charge). The Elite Mini system CCTV kit comes in two variations for four, eight, or sixteen channels. 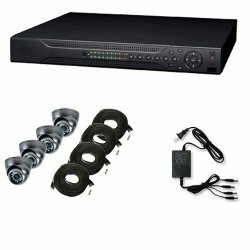 Our first variation Elite Mini system CCTV kit (for each channel configuration) in addition to the Elite Mini HD DVR and Indoor/outdoor weatherproof high-resolution infrared vandal dome security cameras, includes four plug and play cables and a four channel space saving power supply. Our second Elite Mini system includes the same DVR and cameras, but includes one four-channel power distribution box, 1 box of RG-59-18/2 Siamese cable, and four power leads for the power box. These two variations of CCTV kits are also offered for Elite Series and Ultimate Series DVRs. Our eight channel kits offer the same items except there are two four-channel space saving power supplies and 8 plug and play cables in the first variation and one eight-channel power distribution box, 2 boxes of RG-59-18/2 bulk Siamese cable and 8 power leads for the power box. We have two variations for our sixteen channel systems as well. They include the same items mentioned above except there is enough equipment to support the included sixteen digital video cameras. At this time, we also offer a thirty two channel CCTV kit. At the present, we only offer this kit using the 32-Channel Elite DVR. However, we do offer it in the two equipment variations as the ones already mentioned. One of these systems is bound to meet your needs and price range. Our DVRs feature a three year warranty and our cameras and accessories offer a one year warranty. Speaking of accessories, we literally have hundreds of accessories available to further enhance and/or customize your CCTV kit. 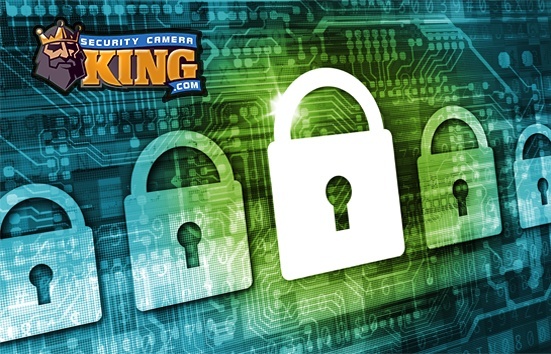 If you are interested in purchasing one of Security King’s CCTV kits, you can purchase them using our on-line catalog site at “Security Camera Systems“. If you need anymore information or have any questions about our security camera systems you can also contact us on-line via our “Live Chat” service or by telephone at 866-573-8878 Monday through Friday from 9AM to 6PM EST.